Though glass Christmas tree ornaments appeared only as recently as 1848, there are few signs of the season as timeless as ornaments. 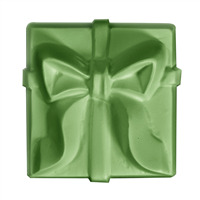 With the Ornaments Soap Mold, you’ll get three festive designs for the holidays including holly, snowflakes, and a spiral swirl. 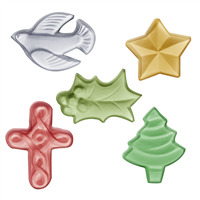 COMMENTS: everybody felt in love with this shape soaps, truly ornaments add glitter to your soaps and you will have a beautiful sparkly ornamnet! COMMENTS: Did not like as much as silicon mold. More difficult to release. 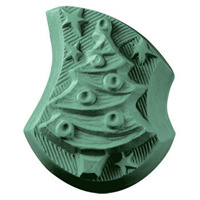 COMMENTS: I made beeswax ornaments for the tree with these molds, they are so cute and fun to be creative with! COMMENTS: Really nice mold. 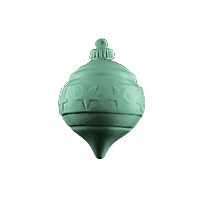 Easy to color the swirls on the ornaments and then spritz with alcohol and pour on your next color. Pops out very easily. Has three cavities. Very pretty. • Ease in use. Unique. COMMENTS: Can't wait to use this mold. Definately will be a big seller! COMMENTS: The cutest - just like little Christmas ornaments! 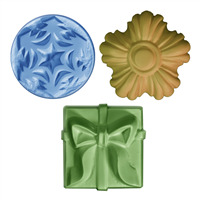 "Anyone know the measurements on the individual ornament soap?" Staff Answer The dimensions of each bar are 3" x 3" x 1 1/8".